My knee keeps shaking. I should sit still but the movement keeps me just slightly calmer. Watching the straight black trousers covering my knee dance up and down means I can more easily avoid the gaze of the people who pass by me with broken hearts. Not many places can make my stomach feel this way. 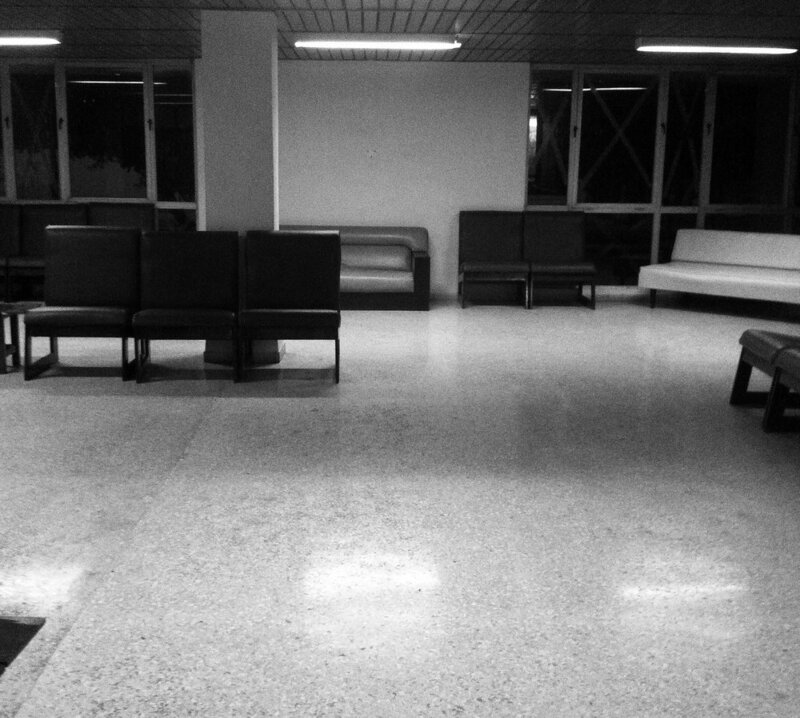 Sometimes a hospital waiting room. Maybe even a church. I’ve never been sky diving but I imagine I feel the way someone does the moment right before they jump from the plane. But at least once they’ve jumped they enjoy every second of the fall. The door lightly opens and another poor woman emerges quietly. She looks the exact picture of what I’d think someone wrongfully sentenced to the death penalty would look like. Her head hangs low but her sore, red eyes are still visible to someone who cares enough to pay attention. With a meek stride, she makes her way towards the front door. Then her pace quickens as her emotions begin to fail her just as she is about to reach the escape. For less than a second I can see the pain she has as the tears explode from her face. Then like all the others, she’s gone. Briefly I think I should follow the others and run out of the lion’s den before I get torn apart. At least I’d be walking out on my own terms with my head held up. Not shamed or insulted or with my dreams crushed. But I could never stop myself from trying. As I’m standing up the young girl that’s been sitting next to me gives me a kind smile. As if to say ‘good luck.’ She can’t be more than 19. Her request must be against termination. She can’t be any more than two months along then. As my back is to her and I walk away she even says the words to me now. ‘Best of luck.’ I’d probably think she’s a very sweet girl if I’d spoken to her a little bit. She’ll never be approved. That’s why I haven’t said a word. Passing all the other desks as I walk towards the door I briefly catch a glimpse out of the corner of my eye of just how miserable everyone in the building really looks. People on both sides of the desk look like they’ve been beaten down and have no spirit in them. Some of the workers even look worse than the applicants. But if I’m seeing the man that has his own office, does that mean that he’s worse than the employees out here, or that he isn’t quite as bad? By the time I’ve asked myself, I’ve reached the door and my hand is on the cold metal of the handle. Probably for the best that I don’t have time to think about the answer to that question. I can’t think of anything I wouldn’t give just to have Stephen with me right now. The only thing I want more than to be approved is to have him next to me. Why did I think I could do this alone? If I wasn’t sitting already I would have collapsed after the second question. He asks with what I can only call pure indifference. He probably only shops in Marks and Spencer’s. Or some other place I’ve never even set foot in let alone shopped at. I’m trying to speak while biting the inside of my lip as hard as I possibly can without it being visible. Not that he would even notice if blood started pouring from my mouth. He’s been hanging his head and has barely looked at me since I sat down. I wonder if it’s out of fear of seeing me become upset. Maybe he despises every moment of the process and avoiding eye contact is how he handles it. It might be that he needs to keep people like me as distant as he can for his own conscience. Or maybe he just thinks so little of all applicants that it’s not worth his time to so much as look any of us in the eye. One of the few achievements I’ve made in my life and he feels the need to make it worthless. Now I know for sure why he barely looks at me. It’s not out of fear he’ll see me upset or because of a guilty conscience. I still feel the need to cry. But the biting helps me hold back enough. Don’t crack now Mary. Just keep it together. Don’t let this heartless little prick upset you in person. Just answer the question. The deposit. That’s every Sunday that offered time and a half, every friend’s birthday night out we missed and every Christmas present we couldn’t justify buying for each other. I place the stack of £20 notes in his hand and in a split second he tugs it back to avoid touching the unclean hand of a common woman. He doesn’t bother to answer. He doesn’t bother to even look at me when he shakes his head. He doesn’t have the slightest shred of interest in any of us. The door handle now feels on fire from the heat of my hand. I can feel my back soaked in sweat and dirty all over. Not because of the sweating. I’m walking to escape just as quickly as number seven did. But I won’t cry. Not here. As I walk past the sweet girl she stands up with her face frozen in fear. She stutters out that she is number nine and is pointed towards the lion’s den. I shouldn’t do it. I shouldn’t give her any hope. Not even the slightest bit. It’s false and won’t help her at all. But I break. As we pass I give her a kind smile and just for a second, a reassuring pat on the shoulder. Her face changes just a little and I can see the fear on her face ease ever so slightly. With our backs now to each other we go our separate ways. I feel shame for trying to make it easier for her. For the few seconds that it takes her to reach the door I’ve made her feel a little better. But I know I’ve probably just made things worse in the long run. With a brief glance back I can see her disappear into the office. She’s got no chance.